The 1910 T210-6 Blue Grass League Series 6 Baseball Card Set contains 66 cards measuring 1 1/2" x 2 5/8". All T210 Baseball Cards feature a "red border" on the front of the card framing a black and white photo of the player. The back of the cards contains an advertisement for Old Mill Cigarettes. You can tell which series (1-8) a T210 Card belongs to by looking at the top back of the card. The T210 set featured solely minor leaguers, and the T210 Series Six set includes players from the Blue Grass League (almost all of whom are relatively unknown and spent little time in the major leagues). The only notable player included in this issue is the T210 Casey Stengel card. 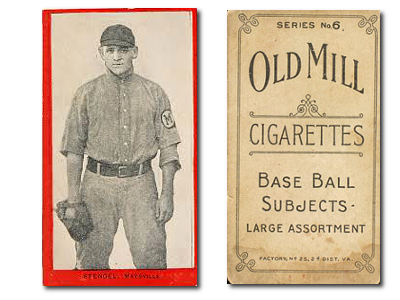 CLICK HERE if you want to sell your 1910 T210-6 Old Mill Blue Grass League Series 6 Baseball Cards.